Ages: 16 and above, some cussing and brief explicit scenes. Two chapters into it I already knew that I’d rate this book either a 4 or a 5. 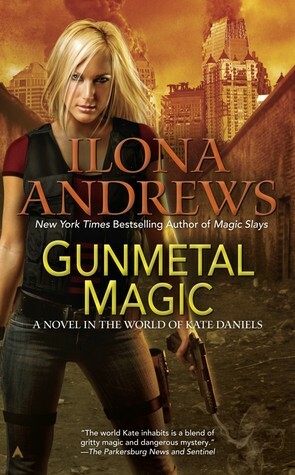 Gunmetal Magic is written in the world of Kate Daniels and here we have a look-see in to Kate’s best friend Andrea Nash’s (Andi) life, the gun wielding bad a** bouda (were-hyena). I found that I liked her as much as I thought I would have. She was a loyal friend and a good person, she had a temper and an attitude that suited her fine. Because of her status as a beastkin (her father was an animal that turned into a human rather than the other way around), she was despised my the majority of shape shifters, it’s some kind of deep seated prejudice between them, deep enough that they want to kill her. As a result during her childhood she, and her mother also, was brutally abused by her clans people. We learn more about her earlier years. If you’ve read the Kate Daniels novels you would have met Andrea and know that she wouldn’t take things lying down. Andi was a former knight of the Order of the Knights of Merciful Aid who kicked her out because they discovered that she was a shifter, despite her loyalty and years of working with them. The thing is they say they protect civilians from magical disasters and such but for the most part the people at the top dislike all shifters. She hated and was ashamed of what she was that was part of the reason what she and her ex boyfriend the alpha of Clan Bouda, Raphael, had fallen out. She now works with Kate at Cutting Edge, Kate’s private investigative firm that deals with magical hazmat and the likes. In this book four of the were-hyenas were murdered they were employees of Raphael’s re-claiming company and were found dead at the work site. The security chief of the Pack and alpha of Clan Cat, Jim, called on Andrea to head the investigation and she has to work along Raphael, to her chagrin. We see more of the dark volhv (a sort of Russian druid) Roman who will be aiding Andrea. He also has a crush on her from the previous books. He’s not really dark, but he has to live up to the image or his family will nag him to death. Roman’s a cool dude, I wouldn’t mind to have him as a friend at all. Eventually Andrea sorts out her emotional tangles, her relationship with Raphael and comes to accept who and what she is. The book is kind of split into two plots: one is about Andi and Raphael’s relationship and the other is about the murders and the reasons behind them. It’s not entirely necessary to read the other books but you will not understand the little inside jokes or know of the secondary characters that are mentioned once or twice and their significance in the plot. But it’s not that bad, I’m pretty sure a rookie in the series would enjoy Gunmetal Magic. Illona Andrews did not disappoint. There’s the sharp wit and much enjoyed humour that’s sure to be found in the Kate Daniels books. I was a bit apprehensive at first that despite the fact that Andi and Kate came from two completely different backgrounds writers in the past have made the mistake of making two characters sound the same. Fortunately this wasn’t the case in Gunmetal Magic. Andrea has her own distinctive voice that could be heard over the roof tops when she gets ready. In the Kindle edition that I have a novella, Magic Gifts, written in Kate’s point of view was included. She’s mentioned in Gunmetal Magic and is partially involved in the plot but she was on another job aside from Andi’s. Where hear she’s onto something concerned with the Vikings but were not told what. In the novella we see her side of things while Andrea was going about her business and I’m grateful for this because it was eating me to find out what Kate was up to. I’ll talk about it in another review. I thoroughly enjoyed the books and I’d recommend it to everyone.